Up to two heavy-duty single-pole single-throw (SPST) switches, or one single-pole single-throw (SPST) switch with one single-pole double-throw (SPDT) switch, rated for up to 25 amperes, are available. Compact size of 3.48" (88.39) x 2.65" (67.31) x 2.50" (63.5) makes this timer an attractive alternative for applications where space is limited. The model 444 electromechanical timer is ideal for countertop appliances, dryers, and other household applications. All switches: 7.5 amp 250 VAC, 15 amperes 125 VAC, 1/2 HP 125/250 VAC, 25 amp 250 VAC (heater). .250" (6.35) or .187" (4.75) x .032" (.81) male spade. Additional isolated terminals available. Numerous cycle times and operating intervals available. Permanent magnet, 24 VAC, 115 VAC or 230 VAC nominal voltage inputs at 50 Hz, 60 Hz or 50/60 Hz. 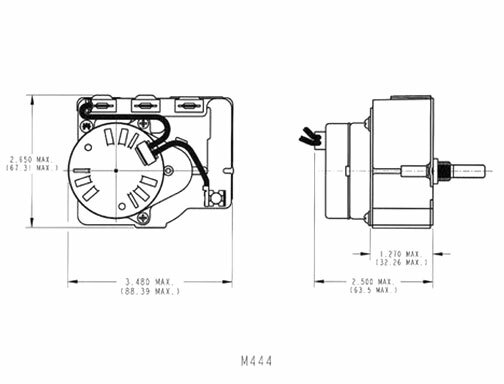 Motor leads 4.5" (114.3) long standard. Clockwise or counterclockwise with bi-directional friction clutch standard. .248" (6.3) diameter steel shaft. Split, flatted, threaded, and other configurations available. Four extruded and tapped #8-32 holes 1.125" (28.58) and 1.625" (41.28) apart standard. Other configurations available. Countertop appliances, battery chargers, household clothes dryers, commercial ovens, and steamer ovens.